Roast sweet potatoes topped with beef and mushrooms coated in a masala spiced tomato sauce. 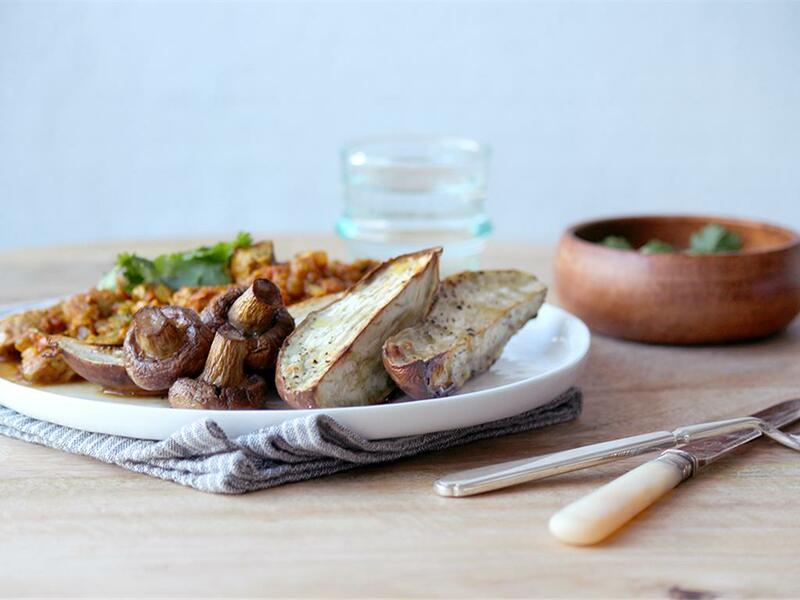 Sweet potatoes & mushrooms: Place separately (sweet potatoes on one half and mushrooms on the other) on a tin foil lined baking tray with a drizzle of olive oil and season with salt and pepper. Mix, arrange in a single layer (the stalks of the mushrooms should face up) and roast for 30 minutes until golden and cooked. Masala beef: Coat the beef cubes with HALF the Curry Masala Spice Mix and season with salt and pepper. Place a pan on medium-high heat with a drizzle of olive oil. Add the beef cubes and sauté for 3-4 minutes until golden and cooked, but slightly pink inside (make sure they don’t overcook, as they’ll be chewy). Remove from the pan and set aside. Masala sauce: Using the same pan on medium-high heat, add the onion with a pinch of salt and cook for 5 minutes. Add the garlic with tomato paste, water (1 tsp for 1) and the REST of the Curry Masala Spice Mix. Cook for 1 minute, then add the tomatoes, season with salt and pepper and cook for another 8-10 minutes until the sauce thickens. Mix in the roasted mushrooms and the beef, add a squeeze of lemon and sprinkle with fresh coriander. Serve the roast sweet potatoes topped with the saucy masala beef and mushrooms. "Easy to make, enough certainly. I have an issue in my diet re carbs and I know I can throw away what is too much but one of the reasons I chose this way was no wastage of precious food. when others have not enough...., wastage is not good."